Professional CPR specializes in business or corporate group training! Our commitment to building a more aware and prepared community extends to local businesses, which is why we can meet any training need. With over 30 local instructors, we can provide classes at your location, blended (online & hands-on training), or training your employees at our facility. Class at your location or office! Your employees come to our location! You can also choose a combination of these options! At Professional CPR, we have something for everyone. We pride ourselves on being able to custom tailor any of our services to best fit your staff schedule. Classes at your facility any day or time, 24/7! No space for training? We can host your group for you at one of our two classroom locations in Sacramento or Modesto. Group classes come at a discounted rate, and large groups can be eligible for specialty pricing. Flexible payment methods: invoice, cash, check, or credit card are all accepted. Fully staffed administrative team to do the work for you! Custom enrollment pages made specifically for your company. Health Association, American Safety and Health Institute, and more! We bring the classroom to you and provide a complete training experience for your staff at your office or business. Professional CPR specializes in onsite training classes small and large groups of 8 people or more. Onsite training also has the benefit of discount pricing and we can tailor the classes to meet your specific needs. Perfect for clients with a large number of employees who need certification but don’t have enough time or capacity to hold a regular in-person class. Students will complete an intuitive online portion of class followed by an interactive hands-on skills session designed to be much shorter than regular training classes. 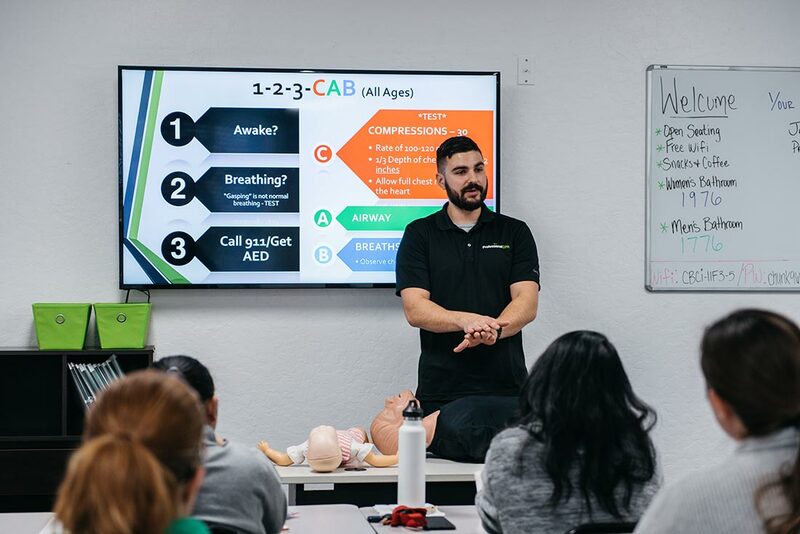 Professional CPR offers multiple public classes every week at our locations in Rancho Cordova and Modesto. Employers can simply create a Hosted-Group account and send as many employees as they wish to our classes. ProCPR will then invoice your company on a monthly cycle for those employees at a discounted rate! Here are just a few of our business clients that we have been serving since 2001!